Hello, Friends! 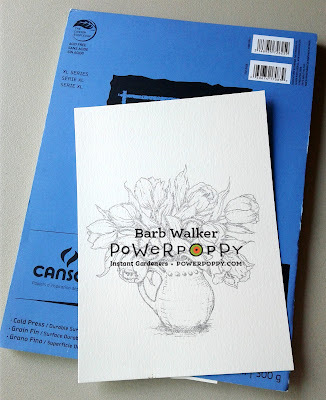 To celebrate Kathy's TENTH coloring challenge, I'm participating in The 30 Day Coloring Challenge blog hop featuring my favorite stamp company, Power Poppy! Yaaaay! So. I am finally doing something that I have been wanting to do for a while now. And taking a cue from Kathy's post, HERE, I am creating a piece of art that will (hopefully) be frame worthy. It's no secret that I adore Marcella's illustrations and so I have been wanting to color up some of the digis, frame them and use them as wall art in The Hive. 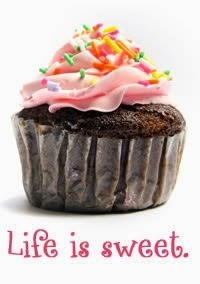 I started by enlarging my digital stamp. Here I'm using Tulips in Hobnail Pitcher, one of my absolute favorites. 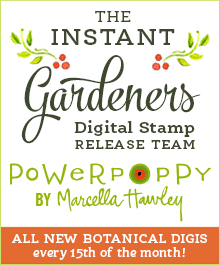 That is one of the many things I love about digital stamps; they are so versatile! I can enlarge the image or shrink it down. LOVE that! Anywho...next I printed the image onto Canson XL watercolor paper. I used the rough side because I love the texture. Then, I selected my color palette. That's the fun part! I went right to the Power Poppy file on my laptop and browsed through the Hues to Use folder, until I found the perfect palette for my project. 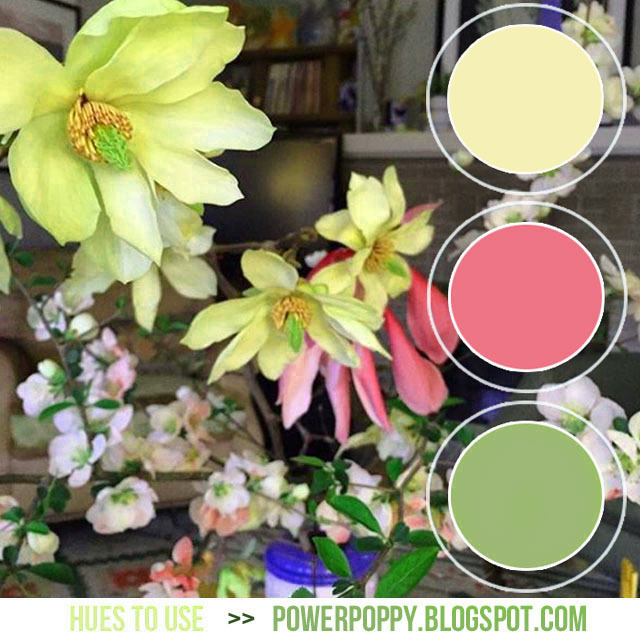 Here's a tip: Each time a new Hues to Use pops up on the Power Poppy blog, I save it in a folder on my computer. This way, I have them all organized in one place and I can access them without having to go online. Isn't this one gorgeous?! Pre-designed color palettes are an excellent way to jump start creativity. It's one less thing to think about and one can get right into the fun of coloring. Power Poppy has quite a selection of palettes and they add to them often. I like that there are just three colors to work with. I use them as a springboard and then add in other colors as I need them. Next, I went to my colored pencil stash and pulled the colors I wanted to use. I do this for a few reasons; I like to isolate the colors I want to use so I don't get distracted by all of the pretty colors in my collection. :) And, having just the colors I need, makes it easier to grab and go so I can take my project with me when I'm out and about or if I want to color in a room other than The Hive. For this project, I am using Prismacolor Colored Pencils. I've assembled my cast of characters. And now, I'm ready to color! I like to start with one element in the image. I choose to start with the leaves. I lay down light layers and just play with the colors until I achieve the look I desire. I LOVE that texture that shows through. It makes my heart happy. I'm also using my new desktop easel that my Mother gave me for my birthday. I love, love, LOVE it! Please click on the pictures to enlarge them. In this next photo, you can see how I've added more layers of color on some of the leaves and started to get into "the nooks and crannies". This is a "take my time" piece. I plan to work on it a little bit at a time throughout the challenge. I can say now that I will be doing a few more of these enlarged digis for framing. I already have, Sunshine of My Life, Graceful Still Life, Chinese Lantern and Everything's Rosy printed and ready to roll! Not sure if I'll switch around or stick to one until it's completed. So what about you? What do you think about creating a piece of frame worthy art? Will you give it a try? Marcella is offering a special sale on Burst of Kindness Clear Stamp set and Spring Meadow digi stamp set. 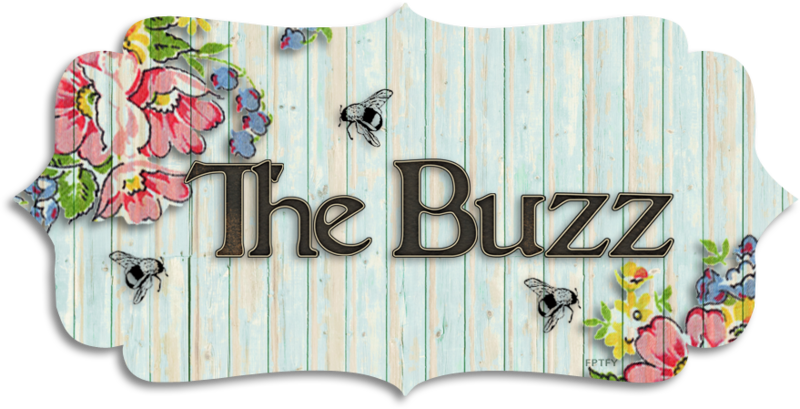 Buzz on over and have a look-see. Sale ends June 9th! If you get lost along the way, you can always go back to Power Poppy! Enjoy the hop. The ladies have a lot of beautiful creations to share with you! That's it for me today. Thank you so very much for stopping by. I appreciate the visit. Have a wonderful weekend! Awesome in every way! That desktop easel looks fantastic! How wonderful for you to have received it. I'm sure it will help your neck, back and shoulders and keep the blood flowing nicely. Yay! I love that you are creating a frame worthy piece of art. Although, to be honest, I do believe each piece you create is frame worthy. I can't wait to see your progress. And how smart are you to have saved the hues to use graphics. Smart lady! Have fun! 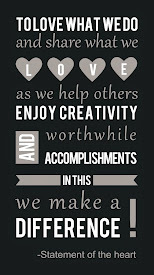 Happy, Crafty Hugs!! It looks beautiful so far!! I totally understand the "taking my time" remark. Coloring is so much fun, I just want to enjoy the process!! Can't wait to see this finished!! What a beauty!!! I love the detail you added to your nooks and crannies - this will be a lovely "frame-worthy" place when all is said and done. Such a great piece to work on when you have time. I love the idea of saving color palettes and only taking those colors when you're ready to start a project - definitely saves on time and distractions. 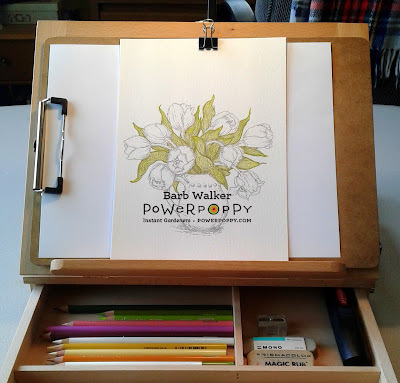 :) You have a great work setup and I love that desktop easel. Thank you for sharing it with us and providing inspiration!! Wow this looks like it will be an amazing piece! Can't wait to see the finished work! This card will be awesome as you work to finish. I like to do that too. Your ideas about filing the color hues is genius! Thnaks! I really enjoyed reading how you assemble and set up your projects. This piece will certainly be frame worthy. Beautiful start. I love digital images because you can make them any size you want. Looking forward to the finished product. What an awesome project! I always forget about Digi stamps & this one looks amazing. Looking fwd to seeing the finished project. Love that easel also! Would sure help the neck muscles. 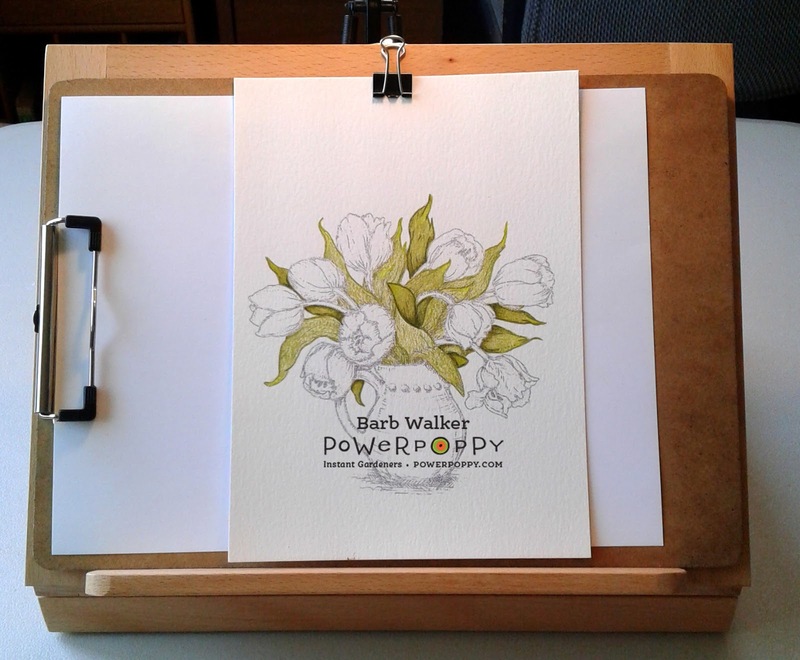 Wow - I love this stamp set and your finished wall art is going to be beautiful!! I think if I start a few at a time they will end up like the rest of my projects, half finished!!! I am trying to stick to one project through the end but.... thank you for the wall art inspiration from Kathy! It is already beautiful, I love the shading and nooks :) I've often thought about trying a desk top easel, but wondered if it would be too different... I will be interested to see how you enjoy yours. WOW Barb, this is going to be gorgeous. Your colouring is flawless. The desk top easel looks like something I need as I have OA in my neck and spine so I find it hard to colour for long periods of time. TFS! I love flowers. thanks for sharing. It'll be fascinating to see the progress on this beautiful piece! So pretty - really love to see the progression! Sooo interesting to see using colored pencils on watercolor paper! Never would have occurred to me. Thanks for the inspiration!! Your card is going to be stunning! So pretty Barb! I can't wait to see the finished card! I love your idea about setting aside only the colors you want to use! TFS! I have been coloring smaller images for the challenge, but am considering a frame worthy piece like you are doing. I look forward to seeing this beauty when you finish. Thanks for sharing your creative coloring process. That desktop easel looks really fun and a neck saver!! I love this gorgeous big vase wiht tullips and the start of your colouring is awesome. I also pick my colours first and also working on an image that hopefully is frame worthy, mine is a fairy. Thanks for your part in the challenge, I think it’s such fun to do the 30 Day Coloring Challenge again! what a gorgeous stamp and I love the way you've done the leaves. Working here and there, now and then, yup sometimes it has to be. I'm sure Kathy would approve. This should be treasured! Thanks for the extra tips you offered. Beautiful! I love the desktop easel. Thank you for sharing not only your work in progress, but also your style of working! This image will be perfect to frame. Please finish it and let us know how it turns out. It is so beautiful. 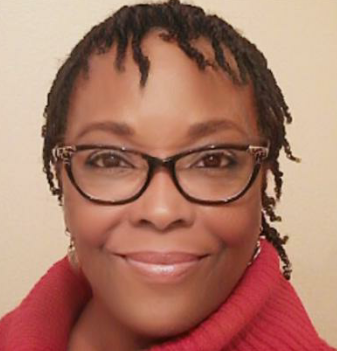 Barbara, I love your joyful spirit! It shines through in your story and sharing...and, your artwork is beautiful! Can’t wait to see the end project. It’s amazing already. What a lovely piece, stunning leaves. So fun to learn about your creative process, thank you for sharing! It’s the starting of a beautiful piece of art. I know your finished coloring will be beautiful! It is already on its way. I am not great with the digital images. I own a few and love seeing how man people are able to change them, but I tend to prefer stamping. Glad so many beautiful images come in both. Love your system. Great image you are coloring! Thanks for sharing, can't wait to see the finished project! Thank you for showing us how you used the Prisma pencils to color your image. I have a set of Prismas but never quite got the hang of using them so looks like I'm going to have to practice. I love the image you choose and i also live that you didn't rush to finish it! Sometimes an image will take me several days. I give myself a break if i start getting bored out my hands hurt, etc. I never feel like i have to rush through on image. Great job. Can your mom and me a clipboard too??? So pretty! Love your card. I love the detail and thank you for showing the step by step! Looks like it's going to be a beauty! I love that your set up for coloring and your process to pick the colors you want so your not overwhelmed!! I can't wait to see your finished project!! Your colouring is so detailed and beautiful! Thanks for the tip withe Hues to Use! Such a brilliant idea! The finished project is going to look amazing! Really pretty! I love how you do one element first. I like to do that also so my colors are chosen and sharpened for that whole section! Thank you Barbara for the wonderful tips. I have just stumbled into Poppy stamps through Kathy's colouring challenge and I am falling in love with these stamps. Will check out the blog for those color combos to kick start my inspiration. Very pretty, can't wait to see it finished. Your coloring is gorgeous. I’m sure the finished project will be beautiful. I like to take my time and enjoy the process of coloring as well. So pretty--this will look fabulous framed. I too start with the leaves and then when I'm ready for the flowers I can see them better. Lovely coloring. I do that, too, pull just the colors I want to use, and for the same reason, but I don't color as beautifully as you do! I’ll get to Carnegie Hall yet, lol. Love that image, too! Great 👍 start on your coloring! Right now my work goes into a folder so I can look back and see where I was and am going. Maybe one day something will be framed Keep up the great work! Love the way you have colored the leaves. My favorite color is green so love the detail you put into the leaves. OK, I am jealous. I tried using that same paper in my printer and it was too thick and would not feed. LOL!! I can't wait to see the finished art piece. The easel is great. I have just been thinking of getting one. I can't wait to see the finished piece. Taking your time I think makes it much more fun and relaxing. I love what you've done so far, I'm sure it will just keep getting better. I'd be interested to see a video of your coloring! Beautiful start to a wonderful project! Love your idea of isolating the colors you are wanting too! So far, so good! And I agree with one of the other bloggers, I LOVE the tabletop easel! Stunning! Can't wait to see it finished! Amazing, looking forward to the finished piece. I love this image and I can't wait to see how it turns out. Great beginning. Wow! Gorgeous leaves colouring! Can't wait to see the final piece!!! Absolutely beautiful. This would take me at least a week or so to color. WOW this is going to be so beautiful and amazing when completed! Beautiful job already on the coloring Barbara!!! Cannot wait to see it as you continue on and finish! It’s the start of something beautiful. Can’t wait to see the progression to the finished piece! This is going to be incredible, I can just tell... Thanks for the tip on the 'hues to use' - I'm definitely going to peruse those! As someone fairly new to card making,could you tell me- do you just print it from the computer printer onto paper? And if so, what kind of paper? Also, does this limit how you will decorate the stamped item? I probably need a slight tutorial - thanks! Very pretty. I hope you post the finished piece. I never even knew about digital stamps. I think I may have to look into that more. What a beautiful image you have chosen for this project. I LOVE the coloring on the leaves - so pretty. After a long winter I was just noticing this week how many shades of green appear in nature and appreciating each and every one! I really enjoyed getting to see your set up. I love the idea of picking out your colors before you start. I do get distracted by all the pretty colors, so I’ll have to give this a try. Your leaves are looking gorgeous. I can’t wait to see how this piece turns out. I might get up the nerve to do a frame worthy piece. We will see. Your easel is a wonderful gift! I'm learning to do the take your time coloring - it's not easy for me! I love that stamp too! I need to look into preplanned palettes...I have such a problem with colors. Can't wait to see it finished. Detailed nooks and crannies is a new concept for me. I need to remember to do it on my next project. I do think coloring is very relaxing, but not sure mine would ever be frame worthy LOL!! 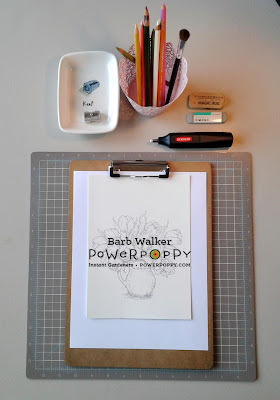 I am pretty new to the Power Poppy. They have all kinds of gorgeous flowers. I'm really interested in the Hues to Use...never heard of it but I know I'm always wondering/struggling what colors to use, so saving them is a great idea & I'll have to check that out. I love the colors you chose & can't wait to see the finished project...I'm sure it will be gorgeous!! Thanks for hint about separating the colored pencils from their container. I think I'll try that. Pencils on watercolor paper? I love trying new techniques and I'll have to try that. And I get lost looking at all the pretty colors too. I will try picking colors first. Thank you for the tips. I can't wait to see your finished project. That desktop easel looks fantastic! Beautiful start! This digi is beautiful, I cannot wait to see the progress! Do you just print your images from an at home inkjet printer? Thanks for the inspiration Barb! I love your detail you shared! The leaves look so real! Thank you. This is lovely, can't wait to see the end result! Very pretty so far! I love your coloring set up, So nice of your Momma! Can’t wait to see the finished product! Very pretty stamp to color in. I like your process. Thank you for sharing! Love your coloring process, thank you for sharing! That image looks like a ton of fun to color! So lovely! I love watching my works in progress grow and become. What a great idea to pick out just a few colours to work with! I guess I figure I have them all so use them, but really, I don’t need them all for every project! Much easier to take on the go. Beautiful work! 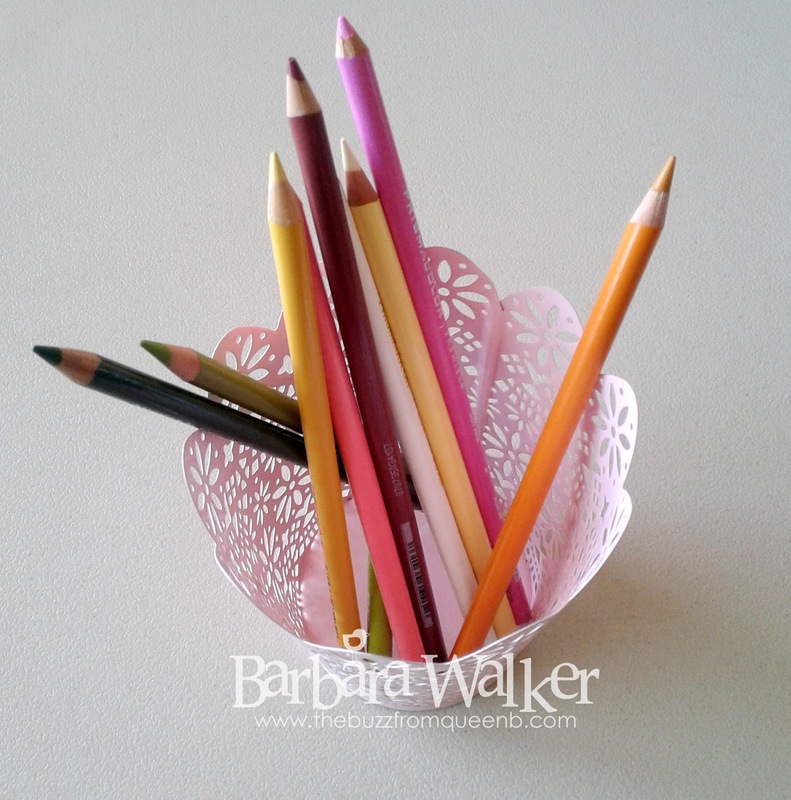 Well you certainly have a good start to creating you frame worthy piece of art Barbara. I love the easel you are using. What a great Birthday gift. I've never thought about doing a frame worthy piece of art but I like the idea. Thank you for the inspiration! Yes, I plan to color things to put on my walls. I'm working on a few projects right now. I always have several things going on at once. Your leaves taught me a lot! The Challenge brought me here and I'll be back! I can't wait to see how that picture looks when I'm finished. I like what you colored so far. It is peaceful to me. The jar has great detail. Lovely job! I love your suggestion to pull only the colors you plan to use...I do just the opposite and it often backfires on me--i get overwhelmed by the choices! I can't wait to see the finished product! This is so much fun. Great idea for choosing and isolating the colored pencils. Love your little desk easel, as well. Will check back to see the finished product! I love tulips!!! This is Beautiful!! I’m looking forward to seeing this work in progress and love your green leaves. I like the idea of making artwork to frame too! Yeah, I'm fairly sure this is going to be frame-worthy! I really like the lights and darks you've gotten on your leaves thus far. I'll have to try colored pencils on my Canson paper (since I try to use other paper for watercoloring) to see if I can get used to that kind of texture. Thanks for all the great ideas; this is a wonderful contribution to Kathy's challenge! I really like how you have explained your process and are taking your time to make this a beautiful piece of art. I think I would like to try and create a piece I'd like to display, I've always thought about doing a series of 3 small images each framed on its on but I still need a lot more practice before I get there, one day! Tulips in Hobnail Pitcher is one of my very favourite illustrations as well, I love tulips. I look forward to checking back to see your finished piece! So beautiful Barb! It’s nice to see a work in progress! Can’t wait to see it finished! That easel is just amazing Barb! It looks like it would be so inspiring to use. Such pretty pencil work too! What a beautiful image! I can see this will be a great piece of wall art! Really like all the layers of colors! So far so good, that's what I say. I like how you did the leaves. Whenever I do flowers, I do one of 2 things. I love colors and I love to color, so I will check what colors the flowers are. With tulips, the color palette is endless so I will do them in tons of different colors. With Hydrangeas, they are usually blue but all blue to me is boring. When I stamped my Hydrangea stamp and colored it, I made it multi-colored and added some water droplets. I wish you could see it here but it won't allow me to post it. I was supposed to give it to someone but I loved it so much I kept it and made them another card. The second thing I will do is just do it the normal way and make the flower the color it's supposed to be. God made colors and with so many beautiful colors, and glitter and water droplets and sequins and other things to dress up flowers and a card, why should you make it the way it's supposed to be made? I ca't wait to see what you do with your card. I think I have what you are coloring but my printer is having a melt down & won't let me print anything right now. I would love to see how your coloring comes out! Thank you for showing us the start of your coloring and for giving us the chance to win something. I love the idea of creating a piece to keep and frame! Your coloring so far is stunning! I am just in awe of your talent! Thank you for sharing! I want a desktop easel! I think that would really help me out a lot! Where can I get one, my friend? Great leaves and thanks for sharing your process! I like to take my time too. It's all about the enjoyment and the beauty!! 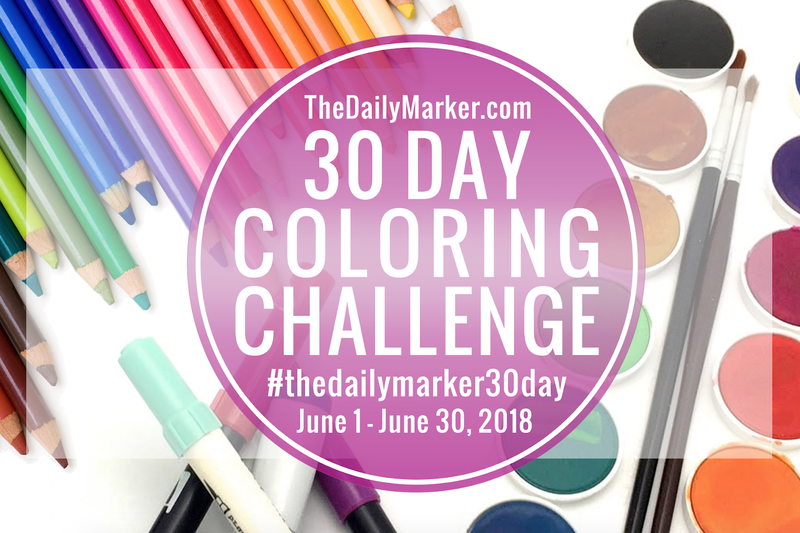 I love your colouring set up...looks convenient and easy to use.